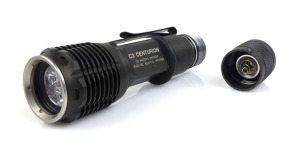 The SureFire R1 Lawman is one of the finest rechargeable duty lights available with a winning combination of solid construction, performance and features (R1 Lawman Review). 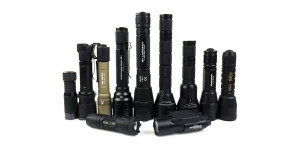 However, with no holsters or other carry options available from SureFire, many R1 Lawman owners have had to “make do” with gear designed for other similarly sized lights. Thankfully a Michigan company, Multi Holsters, has responded to this need with the first and perhaps only holster designed specifically for the R1 Lawman. Available with either a one-piece “Multi Roto” or TekLok belt clip, the R1 Lawman holster is priced at around $60 for the TekLok version. A sample equipped with the TekLok clip was provided by Multi Holsters for this review. The R1 Lawman holster is handcrafted from .093″ black Kydex and is designed to carry the light in a bezel-up orientation. Black oxide coated stainless steel fasteners are used for assembly. The closed bottom of the holster is dished slightly outward to provide clearance for the R1 Lawman tailcap switch. 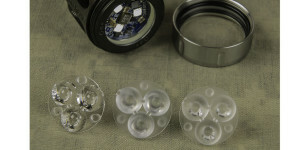 Rubber grommets between the two halves allow easy retention adjustment based upon need or preference. The open end of the holster is slightly flared making it easier to insert the light into the holster. A molded tab extends beyond the top of the holster to provide protection against accidental activation of the side-mounted switch on the R1 Lawman. 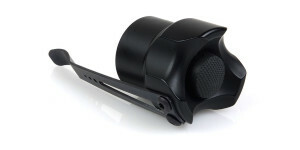 The TekLok belt clip is securely fastened to the back of the holster with two screws. The adjustable TekLok can accommodate belt sizes from 1.25″ to 2.25″ wide and up to .25″ thick (2″ belt shown). This latest version of the TekLok is slightly contoured for a more comfortable fit. Two retaining tabs and a secondary locking system ensure the TekLok will stay firmly attached to the belt. The R1 Lawman fits snugly into the holster and is held in place with no possibility of rattle or movement. When inserted fully, the edge of the tailcap makes contact with the tapered tail of the holster, preventing the tailcap switch button from reaching the bottom. With the R1 Lawman properly positioned, the side-mounted switch is fully protected by the tab at the top of the holster. The SureFire R1 Lawman holster from Multi Holsters was ready-to-go, with no adjustment, right out of the package. Construction is solid with all Kydex pieces nicely formed and finished with smooth polished edges. The only moving part, the TekLok clip, appears to be well constructed and built to last. The holster is sized to fit the R1 Lawman perfectly and the ability to adjust the tension between the two parts helps ensure it will stay that way. The tailcap of the R1 Lawman is wider than the rest of the body and engages very snugly when fully inserted into the holster. The TekLok clip includes two .25″ spacers which can be adjusted to accommodate different belt sizes. The holster works well with belts 1.75″ and larger. Smaller belts may twist with such a long light and holster combination. The holster rides high enough that it is comfortable to wear even when sitting down. It is also easily concealed with a short jacket. 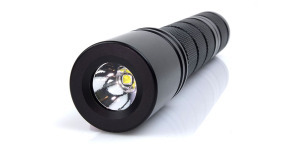 The bezel-up position works well for immediately using the light with the side mounted switch. Overall I’m impressed with the R1 Lawman holster and very pleased the folks at Multi Holsters have introduced this product. The holster fits and works perfectly with the R1 Lawman and allows the light to be carried without concern for accidental activation. 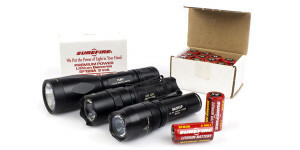 A must have for any owner of the SureFire R1 Lawman. Visit the Multi Holsters website for more information about the SureFire R1 Lawman holster.